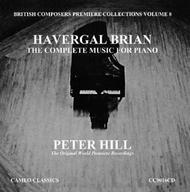 William Havergal Brian was virtually self-taught in composition. He nevertheless rapidly acquired an invincible desire to be a composer and in the early twentieth century began to make a name for himself. Some of his music was admired by Elgar, and works of his were performed by conductors such as Henry Wood and Thomas Beecham, but the musical establishment, with the exception of his good friend Sir Granville Bantock, passed him by and his own growing body of mature work remained almost entirely unknown and unperformed. With the death of Bantock in 1946, Brian lost his last advocate for performances of his music until the early 1950s, when his work came to the attention of a young BBC music producer named Robert Simpson. Simpson gradually brought about over the next quarter of a century a growing number of performances, mostly in radio broadcasts, which began to initiate recognition of Brian�s achievement. Brian died just short of his 97th birthday in 1972. Though he knew that the BBC was committed to broadcasting, in due course, all of his symphonies, not a note of his music was commercially issued on record during his lifetime and he died without having heard many of his finest works.